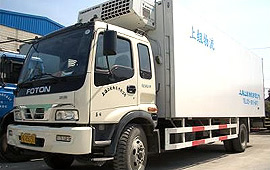 Logistic Services in China｜Integrated Logistics Services｜Services｜Kamigumi Co., Ltd. Since establishing our Beijing office in 1985, we have built a local network spanning China's most important regions. We offer domestic Chinese transportation and packaging, as well as shipping between China and countries throughout the world. We provide a wide range of logistic solutions. In addition to comprehensive support for Chinese import services, including advice on acquiring import licenses and tax exemption applications, we also offer export services, not only to Japan, but to worldwide locations in America, Europe, Southeast Asia and Africa. We also provide domestic Chinese shipping services. We offer comprehensive support systems, including everything from advice and support on the complicated and lengthy processes of acquiring import licenses and applying for tax exemption in China, to final installation and outfitting of local plants. Our branches throughout Japan work together with our sites and partners in China, to ensure our customers receive high-quality, Kamigumi services, no matter where they are. 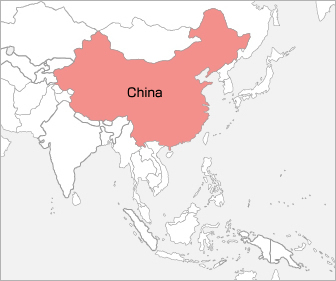 Lead times can be improved and costs reduced for products that were previously shipped to China from overseas on an order-by-order basis, by keeping stock in free trade zones. 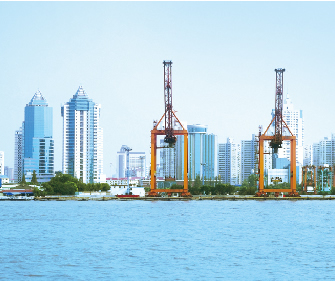 In addition to our own operations in the Shanghai Waigaoqiao Free Trade Zone, we can provide support through a wide partnership network that spans to other free-trade zones as well. Goods from various suppliers in China can be brought to Kamigumi's warehouses, inspected, and then shipped together to Japan in a single container. On the Japanese side, we can then provide comprehensive shipping and management services to meet individual deadlines, ranging from customs clearance, to delivery to individual stores. Consolidating management of transportation and information not only controls costs, it also helps achieve more efficient deadline management. 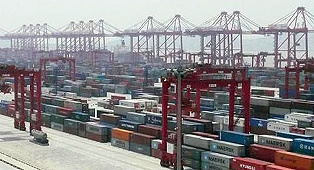 Consolidated transportation of supplier goods and cargo reduces shipping costs. Integrated management of loading, transportation and other processes shortens lead times. Systematic importing to warehouses and delivery to stores helps eliminate unnecessary inventory. …retailers, who import a variety of goods in small numbers. We can also handle large cargo, delicate cargo and plant cargo. We deal in everything from chartering of depot ships to loading and supervision. We have significant experience not only in shipping to Japan, but also in cross transport to countries worldwide, in America, Europe, Southeast Asia and Africa. Using our global network, we can also support arrangement of local transportation. Wherever our customers find themselves, globally, they can rely on us. Kamigumi's China Land Bridge Service is a transportation service to locations not only throughout China, but also throughout Mongolia, Central Asia, CIS countries and other regions. The service combines rail, truck and coastal ship transportation. With over ten years of providing the service, we have built up a wealth of experience. Additionally, we provide efficient services in Sichuan, Chengdu and Chongquing by combining rail and river transport, depending on cargo lead times. By aggregating procurement and distribution processing of parts (inspection, repacking, simple processing)—through cargo milkruns to various parts suppliers, and through integrated shipping from overseas—we are able to implement JIT (Just-In-Time) shipping to production sites. While collecting cargo, we use GPS to ensure accurate and efficient vehicle tracking and management. We use GPS when collecting cargo for more accurate and efficient vehicle tracking and management. We can handle distribution processing such as inspections and repacking, as well. We implement just-in-time shipping linked to orders from production sites. …manufacturers, who procure parts from multiple suppliers. From shipping for Japanese retail shops located in Shanghai to chilled deliveries to convenience stores in the Shanghai area, we handle a wide variety of retail distribution work in China. We own and operate the refrigerated vehicles used for delivery, providing services that are unavailable from other foreign-owned logistics companies.